With the excitement of the new NBA 2K League season underway, the NBA 2KTV crew recently covered a number of topics related to the season. These included a look at the TIPOFF tournament which opened the season, as well as a new tactic that many gamers are using to thrive. In addition, NBA 2KTV spoke with two of the current Memphis Grizzlies players and the NBA 2K Gameplay Director to discuss gameplay feedback. The NBA season is now in playoff mode, but NBA 2K League is just getting started. Their season will move forward over the next several weeks and months to ultimately produce a 2019 champion. The recent event called “THE TIPOFF” was the first major tournament of the season. 2K League’s THE TIPOFF carried a total prize pool of $120,000 with $52,500 of that going to the first place team. As NBA 2KTV’s Blake mentioned, teams are utilizing a new meta in the game known as the takeover mechanic. He said teams are finding whichever player has that takeover attribute going on and making sure they get the easiest buckets possible. Not a bad strategy whatsoever. The 76ers GC squad would pick up the first major tournament win to open the season, as shown in highlights of THE TIPOFF via 2KTV. In the 2KTV episode, co-host Alexis Morgan sat down with the two Grizzlies stars to discuss their NBA thoughts. Tyler Dorsey and Dillon Brooks dropped by to talk shop. They also got a bit of time in on the NBA 2K19 game. In addition to those topics, NBA 2K Gameplay Director Mike Wang stopped by to talk with Alexis and Chris. He answered gamer questions from social media or elsewhere. Mike spoke about recent gameplay developments including ball tangibility with “IK” and bringing back off-ball offensive movements (from 2K14). Mike also spoke about how they’re still figuring out what to do with the archetypes of the game. Gamers aren’t fond of the idea of being “pigeonholed” as a certain player type. Could this change in future installments of the 2K title? Time will tell! 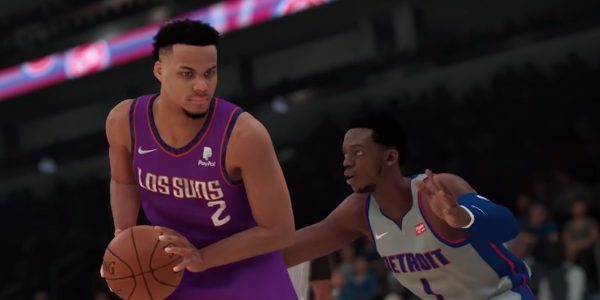 Get more of the latest NBA 2K19 news here including 2K League and how-tos.